I’ve always had a passion for good quality food especially perfectly matured, world-class artisan cheese. So ten years ago, I made the decision to change the direction of my career by switching from being a chef to work exclusively with cheese. I’ve been hooked ever since. This then led me to fulfilling a lifelong ambition of becoming my own boss which I achieved when I opened the doors of George Mewes Cheese five years ago. While I never imagined how demanding having my own cheese shop would be, it has been a hugely rewarding experience. Our mission is to provide the best quality cheese and cheese accompaniments for our customers combined with a consistently high standard of service. 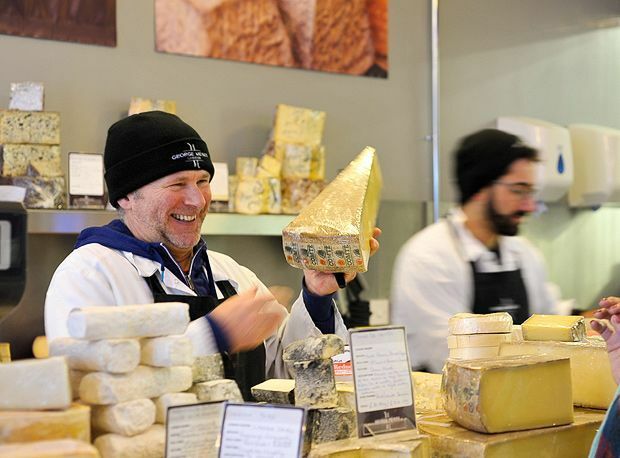 We want to make the cheese shop experience as fun and accessible as possible while never compromising on the quality. We view each customer as an individual and it’s our mission to help them find their perfect cheese. There is nothing more enjoyable than seeing a smile on a customer’s face when they try one of our cheeses for the first time. It’s an amazing feeling when they are overwhelmed and leave the shop as excited about the cheeses as we are. We work very closely with our farmhouse artisan cheese makers and affineurs who are all at the top of their game. We have great respect for our cheeses and we nurture them from the minute that they arrive so that they maintain the finest possible taste and texture. We like our cheeses to be happy and when our cheeses are happy so are our customers.